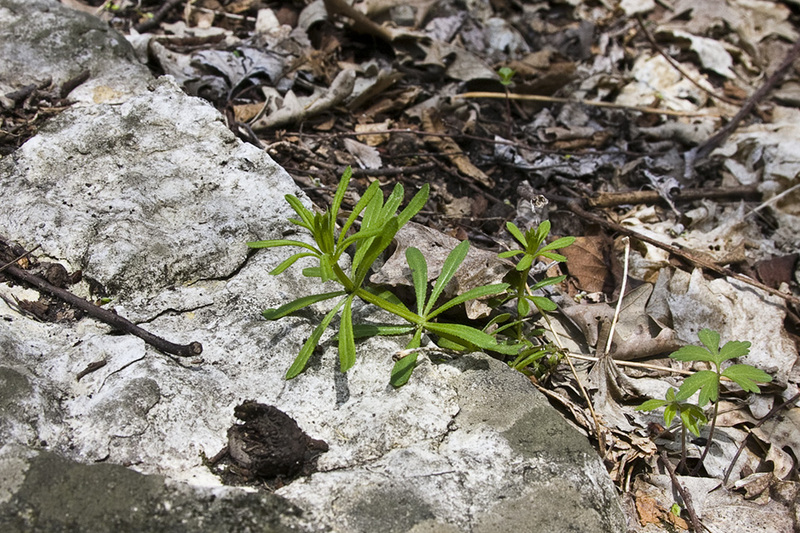 This is a 4″ to 40″ long, more or less scrambling, annual forb that rises on multiple stems from shallow roots. The stems are scrambling, slender, weak, 4-angled, hollow, and seldom much branched. The angles have short, stiff, hooked, downward-pointing hairs. The leaves are in stalkless and in whorls of usually 8, sometimes 6 or 7. The blades are linear or linear inversely lance-shaped, ⅜″ to 3″ long, and less than ⅓″ wide. They have a single prominent vein running from the base to the tip. There is an abrupt, short, sharp, firm point at the tip. The upper surface is rough with firm, stiff, hooked hairs. The lower surface has short, stiff, backward-pointing hairs on the midvein. The margins are untoothed and have short, stiff, backward-pointing hairs. The inflorescences are clusters of 3 to 5 flowers rising directly from upper leaf axils, and sometimes an elongated stalk that rises from an upper leaf axil and has several clusters. The flowers are about ⅛″ wide. They consist of 4 white petals with pointed tips, 4 sepals that are shorter than the petals, 4 short stamens, and 2 short, pale yellow styles. There are 2 carpels at the base of the flower. The carpels are joined together, green, and covered with stiff, hooked hairs. The fruit is a grayish-brown, ball-like carpel, joined in pairs, usually covered with hooked hairs, rarely hairless, containing 1 seed. 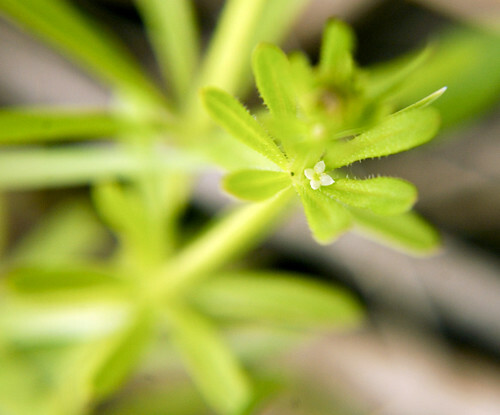 False baby’s breath (Galium mollugo) also has leaves in whorls of 6 to 8. However, the stem, leaves, and carpels are hairless. The inflorescence has many flowers and is larger, highly branched, and showy. The flowers are larger. In Minnesota it has been recorded only in St. Louis County. 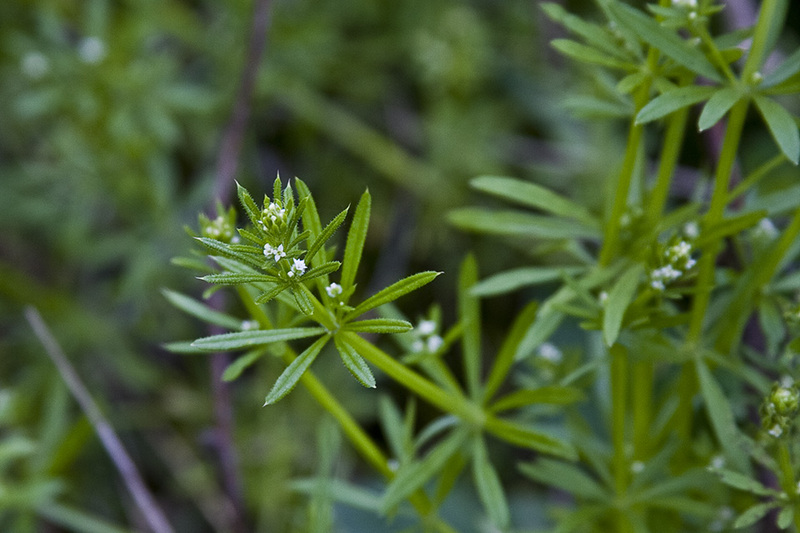 Rough bedstraw (Galium asprellum) has many branches. The leaves on the stem are in whorls of 6, those on the branches in whorls of 4 or 5. The hooked hairs on the leaves and stem grab onto (cleave to) clothing, bird feathers, and animal fur, giving this plant it’s common name. Cleavers have had many uses throughout history. Here are the main features for identification and to distinguish Cleavers from close impostors. 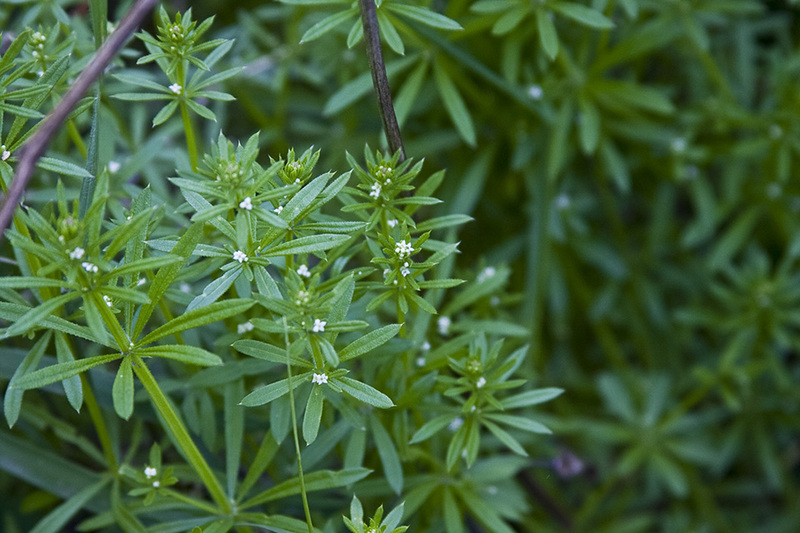 Galium aparine is a herbaceous annual plant of the family Rubiaceae. It is native to North America and Eurasia. 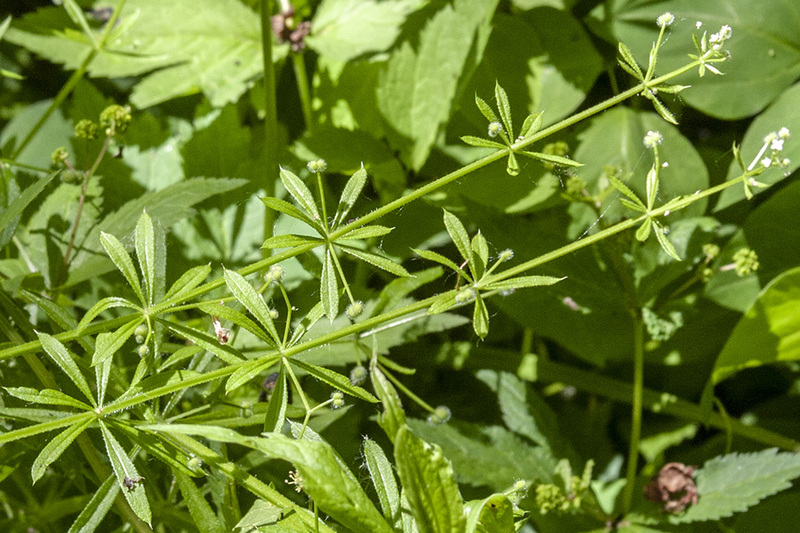 It has several common names, including Cleavers, Clivers, Goosegrass, Stickywilly, Sticky willow, Stickyjack, Stickyweed, Stickyleaf, Catchweed, Robin-run-the-hedge, Coachweed, and Bedstraw. Kleefkruid (Galium aparine) is een plant uit de sterbladigenfamilie (Rubiaceae). Uncle Steve has been fishing along Crabtree Creek at Valley Mall in Raleigh, NC and finds clusters of this "lazy" distinctive wildflower.